Not only do we provide UK schools with some great fundraising ideas, we also help Scouts, Cubs, Girl Guides, Cricket clubs, Football teams, Gymnastic teams and many more, to raise much needed cash. If you’re looking for fundraising ideas for your group then we have some great examples and products that may help your cause. The principal remains the same with any of our fundraising ideas, the FREE art pack we provide contains everything you need to make fundraising a success! Last year we also provided a football team with their own water bottles to take to training, which are not only are they practical but they are unique too. We also make bags, which are an Eco friendly item as they can promote a GREEN message and are ideal especially as supermarkets in England are now charging for them. What makes our bags special is that we stitch and manufacture them after they have been printed, ensuring that your products are UK manufactured and not printed on cheap imported bags. As with all of our products we have a FREE art pack that makes everything easy when you are designing your fundraiser. The art pack comes complete with easy to follow instructions, templates, drawing pen and drawing paper. We also email you a proof so you can approve the design before it’s printed. If you have a bag packing event, these would be and ideal item to be sold on the day. If you find that bag packs at supermarkets have lost its appeal and you want to try something a little bit different and new, perhaps something you have never even considered then why not give our tea towels a go. 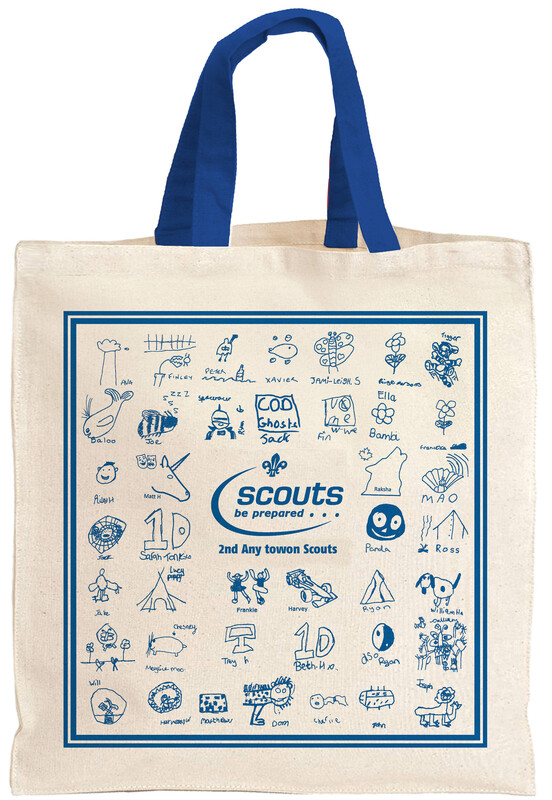 We provide your club or group a free fundraising art pack which make things easy and simple to get going. Along with our comprehensive instructions, we provide you with templates and drawing paper. Best of all there are no hidden extras in the price you see. 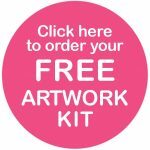 We have a FREE art pack, a FREE return address label for sending your art pack back, FREE delivery of your order. There are NO SET UP COSTS, and we email you a FREE proof prior to printing. If your Club ordered 100 tea towels and charged £4.00 each you would make around £220 for your efforts (not bad for a few drawings stuck to a template). So if you would like a free sample to check the quality of our products then visit our contact page and we will pop some further information in the post. All of our printed tea towels are manufactured and printed in the UK we are a traditional screen printing company with over 20 years experience in Fundraising. If you would like to order your free Art Pack Click the link below, or call us now on 01642 489000 for more information or if you have any questions you would like to ask. Prices are based per design on a single colour print. 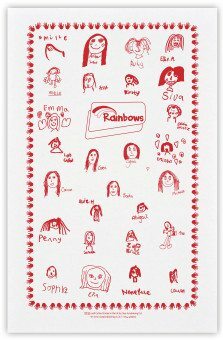 Our printed school tea towels measure 79cm x 51cm and are 100% premium cotton (white or natural). Free delivery in the UK. All prices exclude VAT. Reprints available from a quantity of just 20. Call us for more information. 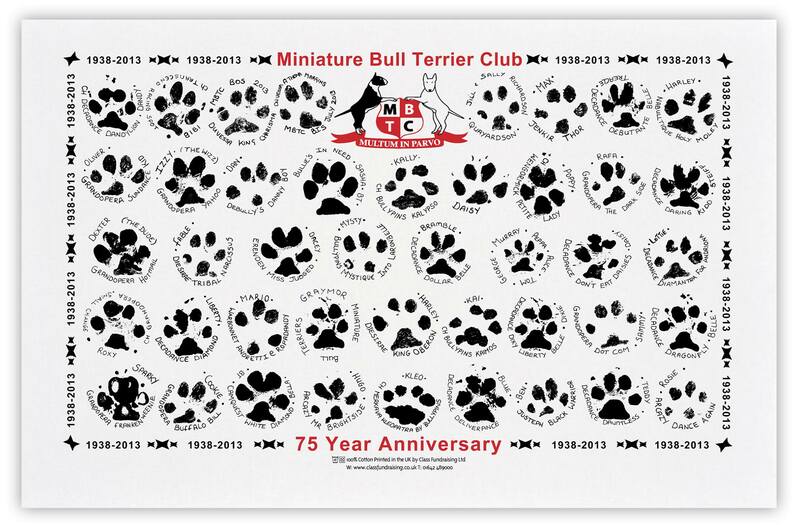 We have even help fund raise for Pet Owners Clubs, see the picture below, they got all the dogs to do a PAW PRINT, this tea towel helped raise money, and at the same time is a truly unique piece of art!